A record 16 Premier League wins in a row, 14 points clear at the top. Will anyone stop Manchester City? No. Not this season you feel. That's it from us for this evening. Feel free to catch up on it all below if you're just arriving. Here's our chief football writer Phil McNulty with his take on the game. Andrew: The scariest part is that Man City are sweeping teams away playing amazing football. They don't care who you are. It's high time those who said Guardiola was overrated last season to apologise. Ahmed: Never seen any better manager than Pep. Tottenham manager Mauricio Pochettino, speaking to BT Sport: "It is very disappointing but in the same way you need to accept that the better team won. We always try positive things but the problem was that we conceded a poor goal. It was a massive present for the opponent and when you play a team like this you who are in magnificent form you have to take risks to be in the game. Of course, they have a lot of quality and can punish you. "The positive thing for us was that in the second half we started really well and had the capacity to dominate. If we should score, maybe Harry Kane when it is 1-1 or when it is 2-0, then it changes. But you know when you are tired we provide space and allow them to kill the game. Today yes, they showed better quality than us. The better team won." Michael: Chelsea didn't let Kevin De Bruyne go, Chelsea scouted him and bought him in for £6m when no other side showed interest. Who let him go? Jose Mourinho. John Crawley: Where were the Spurs that played away to Real Madrid ? They were naive today. Tolulope: Man City are unstoppable. Please beg Sir Alex Ferguson to come out of retirement to stop them. Thanks. Match of the Day running order you say? Tottenham boss Mauricio Pochettino speaking to Match of the Day: "I think it was a good experience for the team, when you win and play well you maybe don't learn, so, you must learn this type of game. We have a lot of positive things, because we played a team in very good form with very good momentum. "It wasn't bad at the start [of the game], but the way we conceded from a corner was a big mistake and a massive present for them, when you play a team in very good form, you cannot give away these gifts. "When you're playing a team with good quality, if we take risks, we give them the possibility of making chances. We tried to play, but they were better, we have to congratulate them. So far, they are the best team in England. "I am very disappointed. We must learn, because one day we want to be in a position to win the Premier League, but today was a big lesson for us. We were never going to come here and play a different way to how we normally play, so, we tried, we tried to force the opener, but they were better." Mhazi: It's not longer a title race but a title walk. Daniel Osunbor: A top class performance from Manchester City. 16 wins in a row. They have beaten all top six sides of last season. James Pye: Sooo... How long until "Pochettino" and "sacked" get mentioned together? Full quotes from him on their way. Manchester City boss Pep Guardiola speaking to BT Sport: "It was solid, good, against one team demanding to be intense without the ball. "They have good quality, but we played really good to beat one of the strongest teams in the Premier League. "Without the ball we are a humble team. 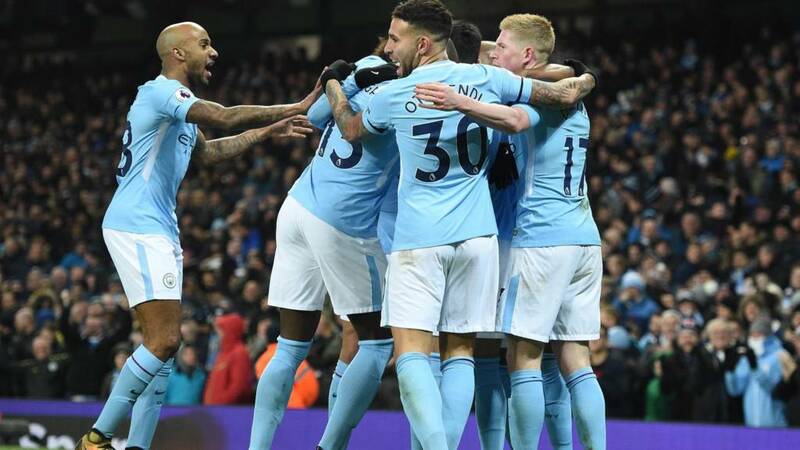 The performance of Kevin de Bruyne, you cannot imagine how good he plays with the ball, but he runs like a player in the Conference league - it is easier for the manager and the club." On Manchester City's record winning run: "Since August we are so happy and I admire the most the way we play without the ball - thank you to the club to provide me with these amazing players. "We are on a good streak, but in three days we have another one." Saqib: This City team look like champions, they deserve to be champions, and there is no team out there in the world who comes near them. Give them the medals already. Stephen Burke: Let's not forget Pep struggled last year and has had to spend big to achieve this. Tom: Disappointing from Spurs, but they remain a really exciting mid-table prospect. On whether Manchester City are thinking about going the whole season unbeaten: "No, absolutely not. "We are here to win titles. We had a great start, it's still more than half (of the season to go) so it's still very difficult - we want to win every game and everybody who comes in is doing an incredible job." On Dele Alli's challenge that saw the Spurs player get a yellow card: "I am a split second before Dele and it happens, it's part of football." Manchester City midfielder Ilkay Gundogan, speaking to BT Sport:"It was an incredible performance. We are happy to beat a team like Tottenham. I was a bit surprised that I was free (for his goal from a corner), I guess the Spurs players didn't know I am strong at that. "I have been through tough times so especially games like today where you are able to improve your self confidence are very important. Today was a good day." Better than the Arsenal invincibles? Eighteen games in and Manchester City not doing too badly. Just the 16 consecutive wins in England's top flight - no team has achieved this before. City's next three Premier League games: Bournemouth (h), Newcastle (a), Crystal Palace (a). Peter Collins: We often say anybody could do what Guardiola does given his level of financial backing. Yet other teams have been in this position in the past, without these results. Pep showing why he is so good. Manchester City were sensational this afternoon, a side that are in quite wonderful form. Once they got the second goal there was no looking back, they were so clinical, so ruthless, they've shown today that they're not only contenders - but probably winners of this league come May. Spurs were outclassed in every department. At times, it was like football as an art form. John Southworth: As a Chelsea fan it makes me sad watching De Bruyne. What a player. Manchester City are the champions of 2017/18. They're going to win the Premier League, there's no doubt about that, they're playing with such confidence, they look unstoppable. Manchester City are 14 points clear. FOURTEEN. It's not even proper Christmas yet. Manchester United play away to West Brom on Sunday.